The 2010 Geneva Auto Show is showcasing some incredible green machines, with scores of auto manufacturers including Porsche and Lotus rolling out fuel-efficient vehicles. 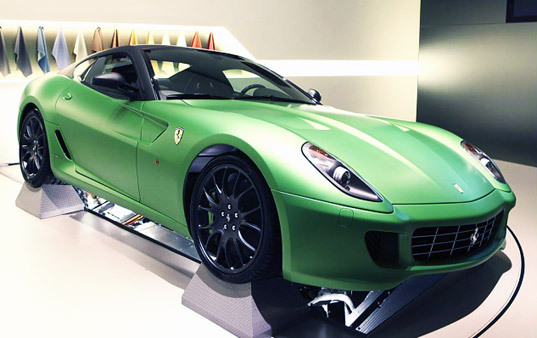 The latest to step up to the plate is Ferrari, which just unveiled its first hybrid: the 599 HY-KERS. Designed as a “laboratory car” that brings Ferrari’s latest racing technology to the streets, the vehicle features a 100hp motor linked to a kinetic energy recovery system taken straight from last year’s Formula One program. 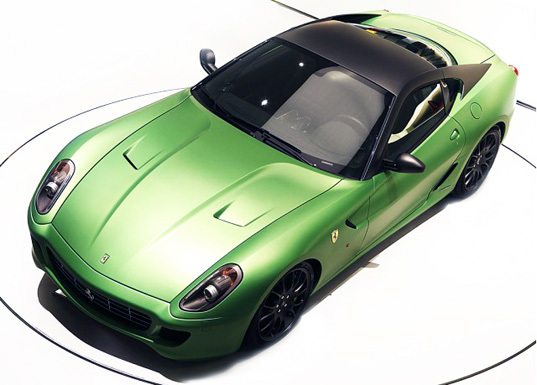 Ferrari’s new HY-KERS hybrid is based on the 599 GTB Fioriano. The vehicle features a V-12 engine linked to an electric motor that provides an additional 100hp. The hybrid system works similar to that of a Toyota Prius – whenever the car brakes, regenerative braking sends energy to a prismatic-cell battery pack, and the engine turns off. This energy can then be used to extend the vehicle’s range or provide a 100hp assist while driving. The vehicle is also capable of operating in full-electric mode for short trips. The hybrid system does add about 220 pounds of weight, although Ferrari found a way to distribute it to give the vehicle a lower center of gravity. When all’s said and done, the retrofit is able to boost the vehicle’s city mileage by about 50%, although sadly that’s not saying much – we’re talking an increase from 9 mpg to 14 mpg. On the bright side, Ferrari chairman Luca di Montezemolo has stated “We want to build a hybrid with huge power and huge performance. Within three to four years, every Ferrari in our lineup will offer some version of hybrid operation.” Here’s hoping they’re able to refine the technology enough to provide more significant fuel savings in the future. Yesterday only i just saw the Geneva auto show on cnbc. And it was great. Its symbol of hero we saw but we have some problem with these news at first . it wont present till 2016 secend :it likes a concept car and we expected to see it better than last model / an the last one is some changes in hybrid`s system. Its Fast, Green and Dazzling! The Ferrari 599,s electric motor boosts outright power to 720 bhp. 0-60 in 3 secs. Maximum speed 210 mph....now thats impressive! I wish I could be in Geneva for the show! I love the Ferrari hybrid. Looks like I'll have to wait until 2015. The 2010 Geneva Auto Show is showcasing some incredible green machines, with scores of auto manufacturers including Porsche and Lotus rolling out fuel-efficient vehicles. The latest to step up to the plate is Ferrari, which just unveiled its first hybrid: the 599 HY-KERS. Designed as a "laboratory car" that brings Ferrari's latest racing technology to the streets, the vehicle features a 100hp motor linked to a kinetic energy recovery system taken straight from last year's Formula One program.